David Lowery"s A Ghost Story (2017) is releasing in movie theaters on April 7, 2017, via A24. A Ghost Story is about a recently deceased man who returns to his suburban home to try and reconnect with his grieving wife. 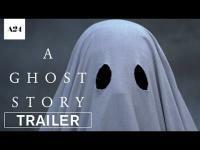 Sonia Acevedo, Casey Affleck, Rooney Mara, and Carlos Bermudez star in A Ghost Story. With A Ghost Story, acclaimed director David Lowery (Ain"t Them Bodies Saints, Pete"s Dragon) returns with a singular exploration of legacy, loss, and the essential human longing for meaning and connection. Recently deceased, a white-sheeted ghost (Academy Award-winner Casey Affleck) returns to his suburban home to console his bereft wife (Academy Award-nominee Rooney Mara), only to find that in his spectral state he has become unstuck in time, forced to watch passively as the life he knew and the woman he loves slowly slip away. Increasingly unmoored, the ghost embarks on a cosmic journey through memory and history, confronting life"s ineffable questions and the enormity of existence. An unforgettable meditation on love and grief, A Ghost Story emerges ecstatic and surreal--a wholly-unique experience that lingers long after the credits roll. Resonating with vibrant memories and silent echoes of a shared life, the old house is somehow connected to "C", a sensitive composer who is hesitant of leaving it, while his loving wife "M", on the other hand, is keen on moving out, having an indecipherable but grim premonition of danger. Sadly, disaster soon strikes, and C's untethered spectre which detaches from the lifeless body, rises from the mortician's table, and in a swift decision, decides to linger in this dimension to faithfully follow the grieving M back to the old house. As silent as a shadow and as invisible as the air, C's unappeasable phantom observes M's denial and depression gradually turn to acceptance and even hope, as time unravels, moving forward through the decades. In this earth, man struggles to leave his legacy behind. Is this the way to immortality?